The 9500 Bi-Folding Trackless Speed Gates are the ideal solutions where speed of opening and closing is essential or where space is at a premium. 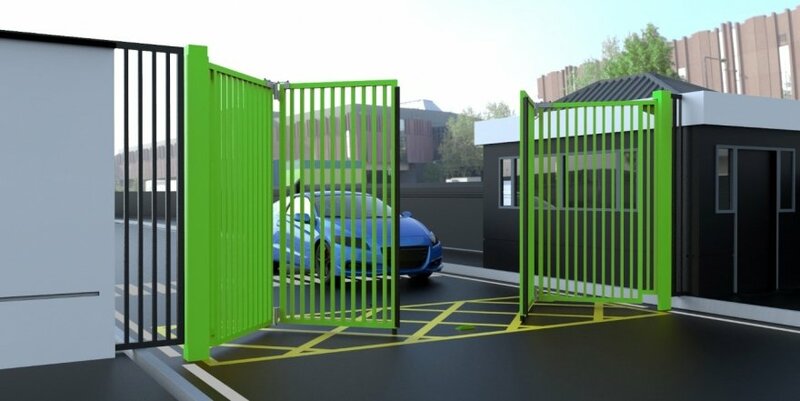 The 9500 bi-folding trackless speed gates typically open at more than twice the speed of a traditional swinging gates of the same size which ensures a fast throughput of traffic whilst maintaining security of the site. The 9500 utilises a driven integrated frequency converter, single phase power, supplying a 3 phase motor, worm and wheel gearbox with a direct-drive shaft connected to the gate leaf, which ensures a smooth and positive movement. 9500 speed gates are rated for 100% duty cycle i.e. continuous operation. A wide range of alternative infills are available to suit customers requirements and to match adjoining fencing design. Also available are spiked tops, warning lights and sirens if required. The gates are supplied with a programmable logic control board which is mounted in the main pillar of the gate. The 9500 Bi-Folding Gates comply with BS/EN 12453 (ALL automated gates must comply with the current legislation). We fit as standard a number of safety devices, including dual height photocells and category 2/3 safety edges.